Cozy weddings, gorgeous anniversary parties and way more — Bungalow 7 has got your party venue needs covered. 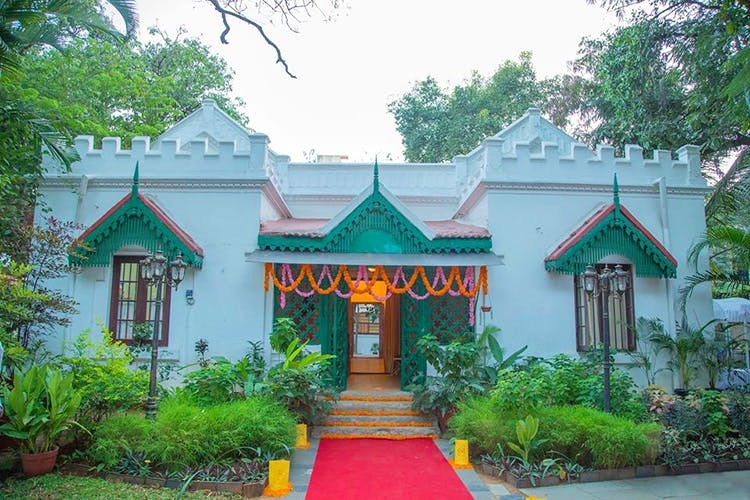 Cushioned in the heart of the Cantonment area is a quaint 110-year-old heritage bungalow, surrounded by plenty of open space, this bungalow is now restored and open to anyone who needs a wedding or party space. The bungalow itself is a beautiful remnant of Victorian architecture with gabled roofs and fort-style edges all in plain white and green. There’s a lot of open space in front of and behind the bungalow which is where chairs, tables and other props are set up for an event. While the bungalow itself is gorgeous, after it’s decorated and set up is when it really comes to life. We saw an amazing white wedding as well as fully colourful desi wedding decor, a bird-cage and floral themed reception and even a Mickey Mouse-themed birthday party! And each time, the bungalow looked right in place! Let your wildest dreams come true because Bungalow 7 will have it done for you.